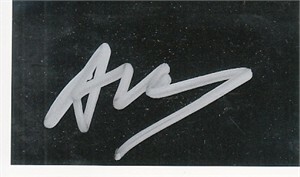 Roughly 2 by 4 inch black photo paper autographed in thick silver paint by legendary Marvel Studios producer Avi Arad. Obtained in person at San Diego Comic-Con appearance many years ago, with certificate of authenticity from AutographsForSale.com. ONLY ONE AVAILABLE FOR SALE.